Summary: Learn how to make repairs to a staircase, prevent stairs from creaking, replace and add a stair wedge, repair a creaking step or stairs, repair a damaged step or stairs, repair a broken baluster and repair a loose newel post. Staircases are complex structures and require expert knowledge to replace, so do not consider doing it yourself unless you have the necessary skills. 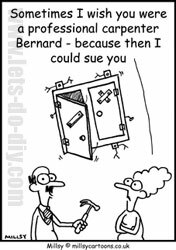 However, it is safe to make minor repairs or to replace banisters and handrails if they are damaged or out-of-keeping with the style of your house. If the stairs creak it is because the wedges supporting the treads and risers have become loose. There are two ways to remedy this problem; from under the stairs by replacing and adding wedges, or from above by screwing the moving tread to the edge of the riser. Locate the creaking treads and risers. Remove any loose wedges and cut new wedges the same size to replace them. 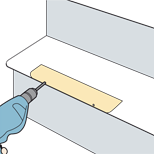 Apply wood adhesive to both sides of the wedge and using a hammer knock it firmly into place to tighten the joint. Now cut a reinforcing block to support both tread and riser. Apply wood adhesive and stick the block in place in the angle where the tread meets the riser in the middle of the stair. Drill four holes through the block to fix it to the tread and the riser. Ensure you don't drill too deeply and come through the surface of the stair. Screw the block firmly to the stair. Apply wood adhesive to both sides of the wedge and knock it firmly into place. Drill four holes through the reinforcing block and screw it firmly in place. 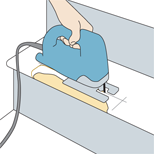 If you cannot access the underside of the staircase, it is possible to remedy a squeaking or creaking stair from above. Using a power drill, drill pilot holes 250mm (10in) apart along the edge of the tread into the edge of the riser underneath. Hold the power drill at right angles to the tread to ensure the drill bit doesn't splinter through the side of the riser. Then screw the tread tightly into the riser ensuring that the screw heads are below the surface of the tread. After screwing the tread into place, fill the recessed holes with wood filler and sand smooth when dry. Hold the power drill at right angles to the tread to avoid splintering the riser. The front edge of a tread is called the nosing. It is the nosing in the middle of the tread that usually becomes worn or damaged. Mark cutting lines around the worn area you want to remove. The longer line will be parallel to the nosing and the other two shorter lines will be at right angles to it. Take a jigsaw and the set blade to the depth of tread. It is important not to cut into the riser. Keep to the guidelines and cut out the damaged section. The cuts at each end of the repair should be angled at 45°. 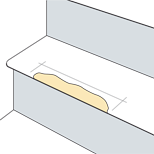 As you cut through the tread you will have to turn the jigsaw before reaching the angle where the cutting line parallel to the nosing meets the shorter guidelines. This will leave a little waste wood in the angle but this can be removed later. 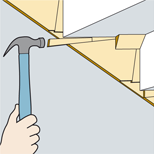 Having removed the damaged wood use a wood chisel to pare away the waste wood remaining in the corners. Cut a piece of hardwood to the dimensions of the piece of nosing you have removed with the ends angled at 45°. Then glue it into position. Once the glue has dried drill a couple of pilot holes into the edge of the new piece of nosing. Then screw the new piece of nosing using 50mm (2in) countersunk screws to the tread. Cover the screw heads with wood filler and when it has dried, sand the surface before finishing the wood to match the rest of the stairs. Mark cutting lines around the area to remove. Use a jigsaw set to the correct depth and keep to the guidelines ensuring the cuts at each end are at 45°. Use a wood chisel to pare away the waste wood in the corners. Once the glue has dried drill pilot holes into the edge of the new piece of nosing and screw it to the tread. A baluster is any one of the short posts or pillars that support the handrail. 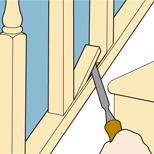 To secure a loose baluster, try fixing it tighter into the fillets (strips of wood between the balusters) on the base rail. 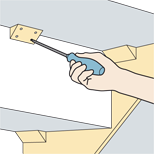 If the fillet is missing or broken, cut a replacement strip of wood to size and fix it in place with panel pins. You may be able to replace a single baluster by removing the fillet next to the broken baluster by prising it up with a chisel. Then pull the broken baluster forward at its base and this should free the top end from the handrail. Fit a new baluster in position and reposition the fillet, securing it with panel pins. 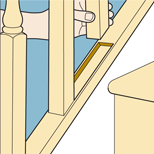 If the baluster is integrated with the tread, you may need to remove the moulding around the join to release it or even saw off the baluster to replace it. If a number of balusters are broken, consider replacing the whole balustrade. Use a chisel to prise up a fillet. Fit a new baluster and reposition the fillet, securing it with panel pins. The large posts at the top and bottom of the stairs are called newel posts and give structural support to the staircase. If you have a particularly long staircase a newel post should be fitted every 2.4m (7ft 10in), but they are generally found at the foot of the stairs and on the landing. Modular newel posts are generally made up of three parts: the newel base; the newel turning (the main part of the post); and the newel cap, which is usually spherical and fits on top of the newel turning. In the event of the newel turning becoming loose at its base, firstly undo the fixing system that connects the handrail to the newel turning. There are various types of systems but generally a cover plate situated on the face of the newel turning will, when removed, reveal a nut screwed onto a bolt attached to the end of the handrail. 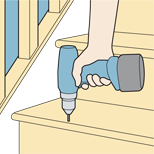 Use a socket spanner to remove the nut and carefully knock the handrail free from the newel turning. Then remove the loose newel turning from the newel base, where a spigot at the bottom of the newel turning fits into a hole on the top of the newel base. 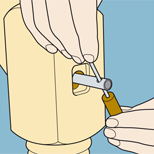 Cut a piece of wooden dowel and knock it into the hole on the underside of the spigot causing the spigot to slightly expand. 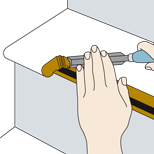 Apply wood adhesive into the hole in the newel base, put the spigot of the newel turning into the hole and using a mallet tap the newel turning into position. Fit the handrail back into the newel turning. Use a socket spanner to remove the nutin the newel turning.